Juggling a full-time job and night classes for an MBA can be hard enough, but somehow Scott Brodbeck managed to find time to train for a marathon too. Brodbeck, who founded two hyperlocal news sites for Arlington(Arlnow.com), Bethesda (Bethesdanow.com) and Reston (Restonnow.com) generallyworks 8 to 6, but says he “never really takes a break from the day job.” He recently earned his MBA from Georgetown University, where he had class two nights a week in addition to homework. 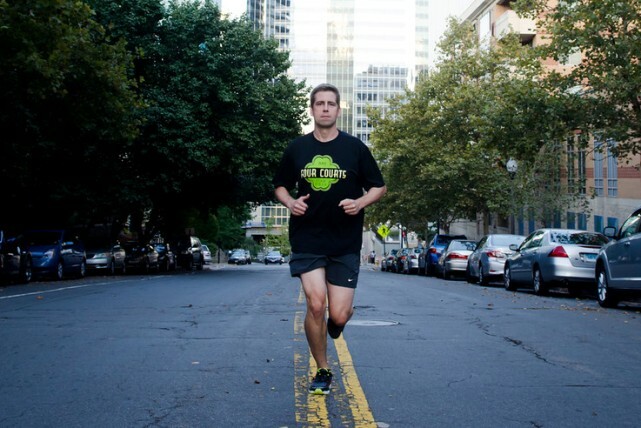 This fall, he tackled his first marathon at the Marine Corps Marathon. Brodbeck, who has been running seriously for about two years, was one of thousands of non-elite runners who crossed the finish line on Oct. 27. Unlike the pros, the average runner doesn’t get to take time off from work, family responsibilities and social gatherings to train. His advice to other first time marathoners on how to fit it all into just 24 hours is to enjoy it and pay attention to signs in your body that could signal an injury coming on. “I think it’s totally doable and certainly it gives you some extra time to listen to audiobooks … so it doesn’t feel like I’m doing nothing during that time. Not only am I running, but I’m reading,” said Brodbeck, who is working his way through the Game of Thrones books during his runs, but plans to listen to music for the race. He had originally signed up for Marine Corps in 2012, but had to defer after a knee injury on his 15-mile training run that has since healed with physical therapy and seeing a chiropractor. “The hardest part is the anticipation of the long runs, given my issues in my knees,” he said. “I always wonder if the knees are going to hold up. After every long run, the knees, the calves, the feet – something is sore. One of the reasons Brodbeck selected the Marine Corps as his first marathon was partly for the convenience of the race being in Arlington, where he lives. He launched ARLnow.com in January 2010 because he felt there wasn’t a good single source of up-to-date, interesting information about the Arlington community online. The site, which he edits, covers local issues ranging from Metro weekend track work to city finances to local business news. He launched BethesdaNow.com to fill the same niche hyperlocal role in that community. The Arlington resident does most of his running on local paths, like the Mount Vernon Trail, Custis Trail and Washington and Old Dominion Trail. However, he occasionally enjoys mixing it up and running on the streets, which gives him a new perspective of the Arlington community. Brodbeck is following a training program designed by Hal Higdon, a long-time Runner’s World contributor, training consultant for the Chicago Marathon and eight-time Olympic trials participant. In the program, which he found online after a friend’s recommendation, he spends about eight hours a week training with hour long runs on Tuesday and Thursday, a long run on Saturday and two bike rides to cross train during the week. He is hoping to finish the race in under four hours. “I don’t feel like I’ve drastically changed my life. I spend those eight hours a week training , but honestly running is the one form of exercise I actually enjoy, he said. Because of his previous experience with injury, he feels it’s especially important to be dedicated to training and stick to a plan, making sure not to increase mileage too much too soon. However, sometimes his schedule doesn’t cooperate and he occasionally misses runs. When that happens, he doesn’t let it derail his training. He either tries to make it up the next day or just skips it and works out even harder the next scheduled run. Though squeezing in time to worry about what you eat may be difficult, Brodbeck has improved his diet by eating fresher, healthier foods and fighting his McDonald’s cravings, only eating fast food “sparingly.” In addition to eating better, the training has also made Brodbeck spend less time on the couch. “I’m playing fewer video games. It used to be that Halo 4 was a good way to unwind after a long day at work, but I increasingly find myself working out instead of playing games,” he said. Though he is new to running, he showed an aptitude for endurance when he was younger. He biked extensively around his childhood home in Pittsburgh. One day, while he was on a ride, his mother Jill got a phone call. “Mom, can you pick me up?” he asked. “Of course, where are you?” she responded. While he’s made sacrifices to train on vacation and improve his diet, there is one thing Brodbeck won’t sacrifice: beer. He’s looking forward to the flatter course for 2013, but what really keeps him going through all the late nights, long runs and sore muscles is imagining the crowds lining the street on race day, something he hasn’t yet experienced at the shorter 5k, 4 mile and half marathon races he’s done in the past.